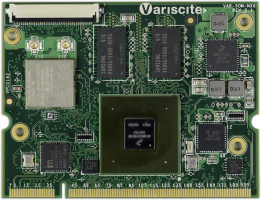 Supporting the i.MX 6 QuadPlus/Quad/Dual/DualLite/Solo SOC, the VAR-SOM-MX6 allows designers to use a single System on Module in a broad range of applications to achieve short time-to-market for their current innovations, while still accommodating potential R&D directions and marketing opportunities. This versatile solution’s -40 to 85 °C temperature range and Dual CAN support is ideal for industrial applications, while 1080p video and graphics accelerations make it equally suitable for intensive multimedia applications. For more information on this product follow this link. Register at the Variscite Customer Portal to get high quality engineering support for this product. Subscribe to the Atom feed of the relevant software package to get the latest updates. This page was last modified on 25 February 2019, at 03:55. This page has been accessed 155,117 times.